Here's something that has worked successfully for a number of years in libraries. It's simple; lend a magnifier along with any book! It's an obvious idea when you think about it. We can supply not only the magnifier, which plugs directly into any television, but specifically for libraries we include a protective carry bag. It's a total solution already loved by tens of thousands of people around the world. Why would a library want to help? Does it really work and is it worth trying? * A letter size laminated poster is provided for the library public notice board. When a patron borrows a book, the staff at the front desk make them aware that there are now electronic magnifiers available to borrow. Typically the person won't need it for themselves, but they may have a friend or relative who they think would like to read again. 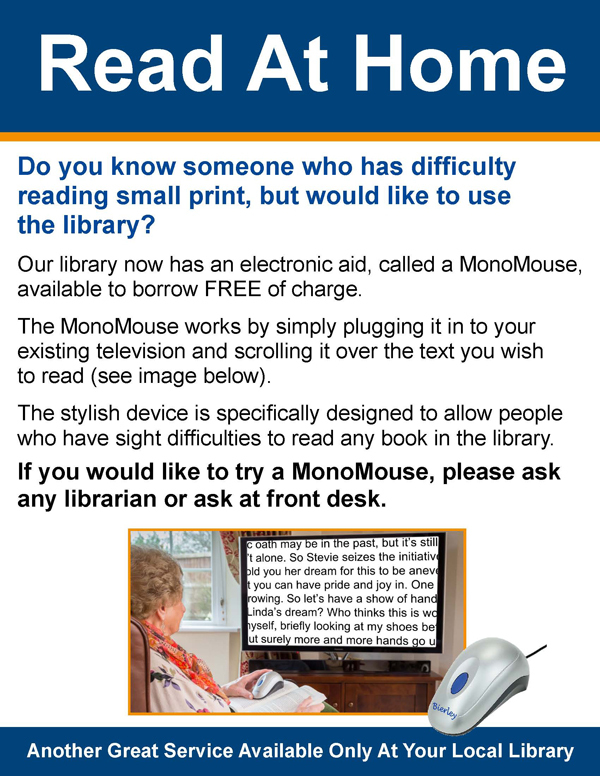 If the friend or relative decide they would like to try a MonoMouse, they or the existing library member would simply borrow one at the same time as borrowing a book. The MonoMouse or the carrying bag can easily be tagged or bar coded to make the process even easier. When the magnifier is due back, the patron returns the MonoMouse just like a book and there will be one of two outcomes. Either they haven't enjoyed it or they have enjoyed it and will ask if they can renew. The main difference to a book is that while you may read a book once, the MonoMouse will allow you to read many books ongoing. There are more than 12 million people nationwide with some form of visual impairment which prevents them from enjoying books from their local library. The large majority of these people are not part of any group or even searching for help to solve their problem. 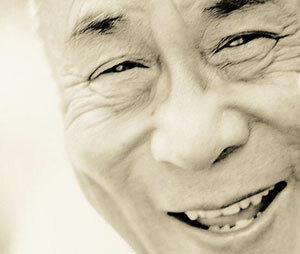 They simply accept that getting old means that they lose their independence. 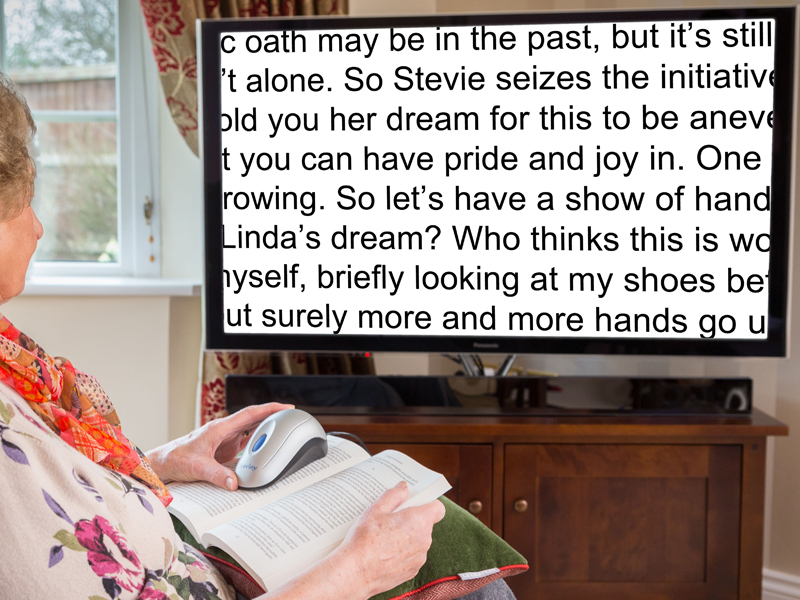 This program helps people to regain their independence and reignites their desire to read again, which in turn means that they start to use their local library more. There are already a growing number of libraries who are actively working with their patrons and helping those people to be able to read again. Over the last few years we have received countless telephone calls, letters and e-mails from people who have a MonoMouse and who have told us amazing life changing stories. It is hard to relate to the emotion that someone feels when they discover that they can once again see printed words. The library holds such great potential of happiness for so many people and we would like to help to open the door and let them in. "I demonstrated a MonoMouse yesterday to an elderly lady with macular degeneration and she burst into tears when she realized that she could read her bible again." Michael B. How much does a MonoMouse cost? The retail value of a MonoMouse is $149. To assist libraries though, we provide a very significant subsidy with further discount for quantity orders. 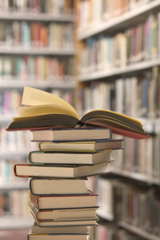 All public libraries automatically qualify for credit terms against an official purchase order. Specifically and exclusively for public libraries, we provide a lifetime warranty against product defects. This means that in the unlikely event of ever having a problem with one of our products, we will repair or replace the item as applicable. There is no fine print to worry about. You contact us, we take care of it. Period. Is the MonoMouse simple to use? Yes. The majority of people that use our magnifiers are aged between 65 and 95, although we do have users ranging from 7 right through to 106 years old! The MonoMouse simply plugs into any TV and when the blue button is pressed, it works! (No complicated wiring, tuning or training necessary). You are most welcome to download and use any of the following images or documents to help attract elderly patrons back to your community library.